Did you ever felt the need to close all the apps in one go which are running in background on any of your iDevice running iOS 4.x? While multitasking in iOS 4 and above is useful, it may slow down things a bit if too many apps are backgrounded, specially on iPhone 3GS and iPhone 3G (Jailbroken with Multitasking enabled) which have half the RAM of iPhone 4. So instead of killing all the apps and processes manually in multitasking tray (aka Task Switcher) to free up the RAM, you can close them all in one tap with “Remove Background” toggle for SBSettings. This toggle for SBSettings is available on Cydia for free. You will need to have SBSettings already installed from Cydia before you can install this toggle on your jailbroken iPhone or iPod touch. Both SBSettings and Remove Background for SBSettings is available under BigBoss repository. Also there’s a tweak in Cydia called “Folder Closer.” Because, if you’re like me, you have everything in folders, everytime you’re done with an app, you exit the app, then have to close the folder. This becomes horribly tedious, this app tweak automatically closes the folder when you’re done with the app. Give it a try. Can I please have the same wallpaper image you have on the screenshot? Where did you get it? It’s not in the iOS 4! The blue background with a matrixey net – where did you get that beautiful desktop wallpaper? I would like that on my iPhone, too. Perfect!! That is much more convenient!! Great work. I love this site. Thank you. Very nice and helpfull toggle. But should have a better Icon. Actually it is very uggly! Open Cydia, go to Search, type in SBSettings. Download and install SBSettings. (Respring device if necessary). Now slide your finder from left to right on the statusbar (the bar found at the very top section of the screen). Tap on More (middle-left section of the screen). Now, tap on Set Toggles. Press the home button and let your device respring. Open SBSettings, tap on the Processes icon. AWESOME – been waiting for this!! 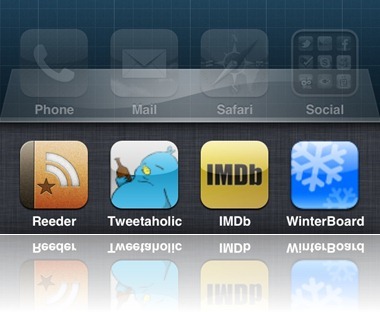 you could also just install the tweak to disable iOS4 multitasking altogether…. I was waiting for this. Cool ! But the icon is really ugly. Also it really isn’t one tap, all off. You still have to individually shut them down, unless I’m missing something. does the multi-tasking apps really reside in RAM? I thought it was saved into flash memory in order NOT to affect RAM – or am i wrong?